I have recently had the great opportunity to ask Michael Willingham, creator of The Diamond Coach and author of “DIAMOND BUYING 101, the resource for your diamond buying experience”, some questions about diamonds. Mr. Willingham has been in the jewelry industry for 20 years, where he has built a reputation as a leader in the industry of jewelry. He served as a resource for major insurance companies; an advocate for the jewelry consumer and, a client-centered approach to those he serves. Prior to creating The Diamond Coach, Mr. Willingham held positions with some of the most prestigious jewelry salons in the United States. 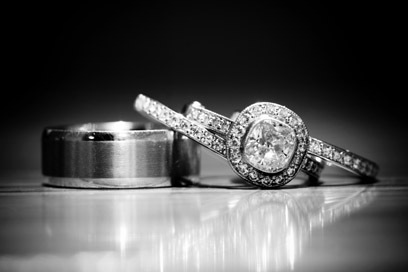 I asked Mr. Willingham some questions I thought brides and grooms might want to know before choosing their wedding bands and engagement rings. Choosing the right shape diamond for your finger is sometimes trial and error, meaning you just have to see them on your finger. Consider spending a day with him visiting jewelry stores and trying on different rings and shapes. If you don’t feel comfortable doing this, or you don’t think he will, spend a day with a couple of girlfriends visiting jewelry stores and trying on different shapes and sizes. A round brilliant generally looks good on any shape hand/finger. For women with small hands and short fingers, you might like something that gives the appearance of lengthening your fingers. This can be achieved with a marquise, oval or pear shape stone. Ladies with long slender fingers might prefer a princess, asscher or emerald cut stone. 2) What are some steps a bride should follow when finding a wedding band to match her engagement ring? This is a great question! Many times ladies have found the perfect engagement ring, only to find they spend the next year searching for a wedding band to match. If you know you want to wear a wedding band as opposed to a single ring, it is best to purchase a set or at least try different bands on with the engagement ring before the purchase. This is not as important with a solitaire because a solitaire will give you many options. The one thing you want to avoid is for the wedding band to look like an after-thought. When choosing wedding jewelry, keep in mind you are going to be wearing the rings for a long time and fashion trends change. That being said, my recommendation is to always buy as traditional as possible – traditional is always in style. One other recommendation ladies…studies show men will spend up to 30% more on an engagement ring if he is alone when he makes the engagement ring purchase. It is important to communicate your preferences to him but as far as shopping with him – I’d let him do that on his own. You might be pleasantly surprised at how much he has listened to you! If you would like to learn more about diamonds, visit Mr. Michael Willingham’s website at http://www.thediamondcoach.com/.